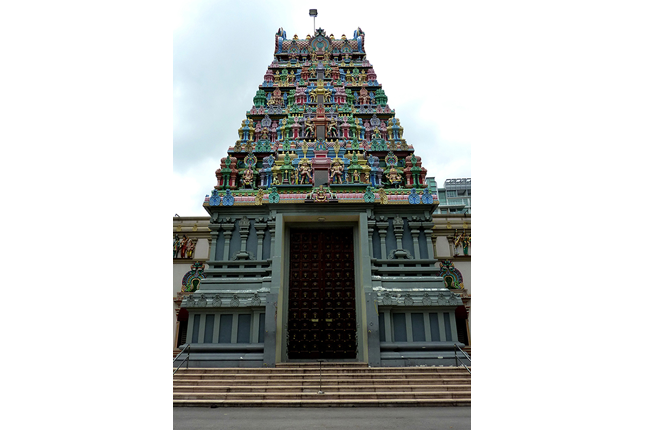 Hailing from the Chettinad region in the southern Indian state of Tamil Nadu, the Nattukottai Chettiars (or Nagarathars) were among the earliest immigrants to arrive in Singapore. They were traders, merchant bankers and moneylenders, and formed Singapore’s main Indian merchant-banking community. Many of the Chettiar moneylenders ran their businesses in long shophouses called kittangis along Market Street and Tank Road. Though small in numbers, the Chettiars were very influential and outnumbered the European banks in Singapore in the nineteenth and early-twentieth centuries. They played a crucial role in transforming Southeast Asia’s traditional subsistence-based economy into an export-oriented one by providing businessmen with capital at lower interest rates. The Chettiars are traditionally followers of Shaivism, the Hindu sect that reveres Murugan’s father, Shiva, as the supreme deity. Even though they left Chettinad for various parts of Asia in the nineteenth century, they continued the practice of building temples dedicated to Murugan wherever they settled. In 1859, the Chettiar community established Sri Thendayuthapani Temple on Tank Road. 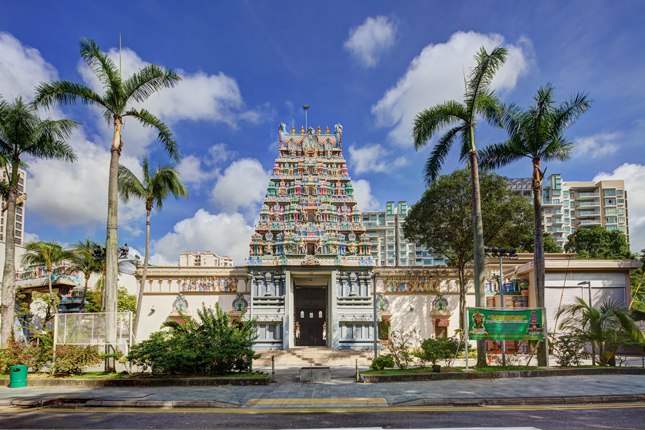 More than 60 years later, in 1925, they built Sri Layan Sithi Vinayagar Temple on Keong Saik Road in Chinatown, where Ganesha, Murugan’s brother, is the chief deity. Both temples are managed by the Chettiars’ Temple Society today. While Sri Thendayuthapani Temple was primarily a religious institution, it also functioned as a social and commercial space for the Chettiars. Every Chettiar firm voluntarily donated to the temple. The Nattukottai Chettiars’ Chamber of Commerce was also established within the temple grounds in 1928. Business transactions were carried out before Murugan’s statue in the past, invoking his blessings and inviting him to witness the transactions. Sri Thendayuthapani Temple has long been associated with Thaipusam, a major festival celebrated by Tamil Hindus – particularly the Chettiars – in honour of Murugan who triumphed over evil. Murugan represents youth, power, and virtue, and is regarded as the Chettiars’ clan deity. 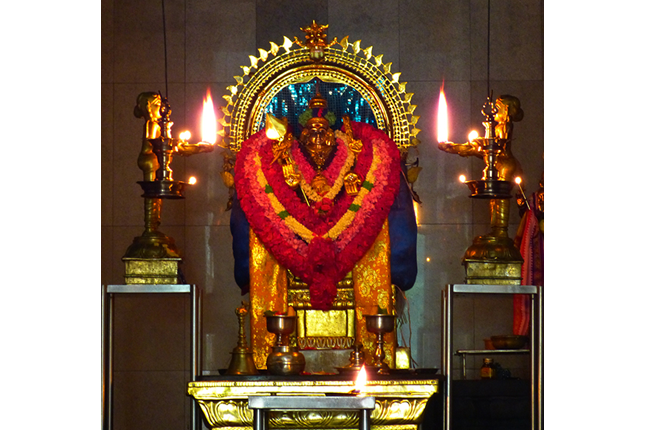 He is also patron deity of the Tamils, and the Hindu god of righteousness. The annual Thaipusam celebration is a grand affair involving impressive processions. On the eve of Thaipusam, the statue of Murugan, placed in a silver chariot, is taken on a procession through the city to Sri Layan Sithi Vinayagar Temple, and then back to Sri Thendayuthapani Temple in the evening. This procession, called Punar Pusam or Chetty Pusam, is usually attended by a predominantly Chettiar crowd. A larger and more spectacular procession takes place on the festival day. Crowds of Hindu and non-Hindu devotees gather at Sri Srinivasa Perumal Temple on Serangoon Road to partake in a three-kilometre procession that ends at Sri Thendayuthapani Temple. Able-bodied men carry kavadis, which are ornately decorated steel structures, either as bodily penance to implore Murugan’s help or as thanksgiving for granted prayers. The peacock is believed to be Murugan’s vahana (divine vehicle), and hence its feathers are often used to adorn the kavadis. Other devotees hold paal kudams (milk pots) on their heads. This elaborate procession ends at Sri Thendayuthapani Temple, where a reception for devotees is held. Prior to the Second World War, the procession would conclude with a magnificent display of fireworks at the Padang. Besides Murugan, other deities are enshrined in the temple. Among these are Shiva; Parvati, who is Shiva’s consort and Murugan’s mother; Ganesha, the Elephant God who is honoured by businessmen at the start of the fiscal year; Idumban, who is invoked by kavadi carriers; Nandi, the divine bull which is Shiva’s vehicle; and Navagraha, comprising nine deities who are associated with heavenly bodies and believed to influence the cosmos. Although Sri Thendayuthapani Temple was initially constructed as a private temple for the Chettiar community, it gradually admitted other Hindus from the wider Indian community over the years. In the late 1970s, the temple committee decided to reconstruct Sri Thendayuthapani Temple. The Chettiar community sponsored the reconstruction cost which amounted to S$3.3 million. On 24 November 1983, the temple was consecrated, witnessed by guests including former President of Singapore Mr C. V. Devan Nair, Mrs Devan Nair, and Members of Parliament. Designed in the South Indian style, Sri Thendayuthapani Temple’s five-tiered gopuram (monumental entrance tower) was one of the tallest and most magnificent in Southeast Asia at the time of its completion. 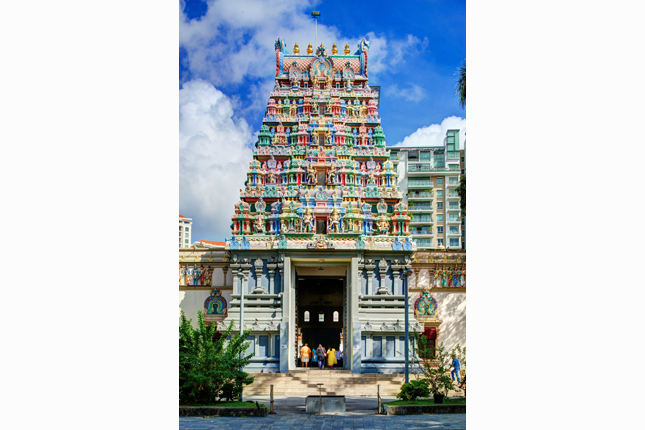 The gopuram enables devotees to see the temple from afar and offer prayers if they are unable to visit the temple. It is decorated with statuaries of Hindu deities, including the various manifestations of Shiva and Murugan. Sri Thendayuthapani Temple features elements that are typical of Chettiar architecture, such as the thinnais (raised platforms) at the threshold and glass panels lining the clerestory of the mandapam (prayer hall). Thinnais are often added on either side of the main entrances in Chettinad homes as sitting areas for family members and visitors; glass panels in Chettiar temples are usually engraved with images of Hindu deities. In Sri Thendayuthapani Temple, the 48 glass panels bring to life the different forms of Shiva’s mystical dance, the Nataraja (Lord of the Dance), and the various forms of Ganesha, among other Hindu deities. The temple underwent another round of restoration in the late 2000s in line with the Hindu tradition of temple renewal every 12 years. It was re-consecrated on 27 November 2009. 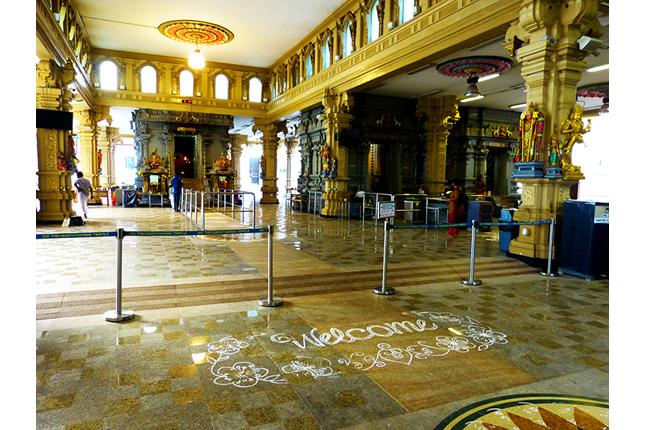 Today, Sri Thendayuthapani Temple remains a popular place of worship for the Hindu community. Apart from the annual Thaipusam celebration, the temple hosts a series of programmes, including walk-a-jogs, and continues to provide annathaanam (free food) during special occasions for everyone. Weddings are also held in the Chettair Wedding Hall, which was built for the community to hold weddings in accordance with traditional rituals.